Heavy vehicles, by their very nature, are complicated machines that demand full and often complex thermal solutions. 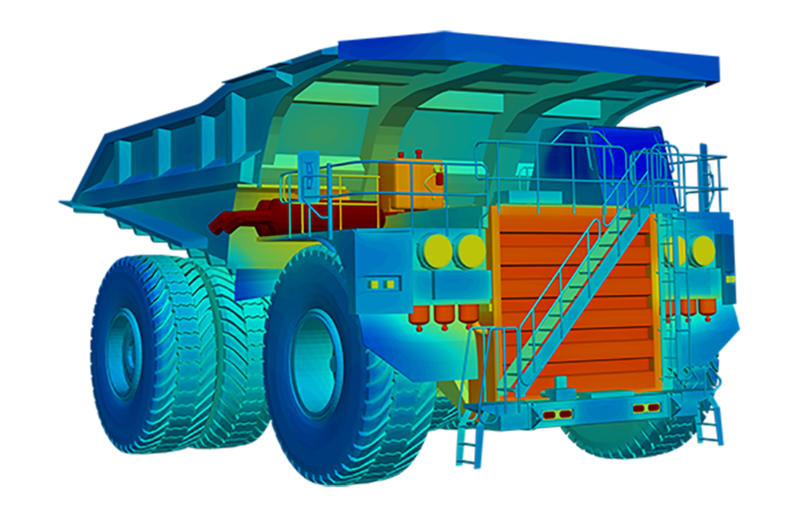 Because of the type of work these vehicles endure, it comes as no surprise that this particular class presents some unique thermal management issues and distinct challenges when it comes to heat transfer modeling, distinguishing them from automobiles. Traditionally speaking, modeling any vehicle begins with a series of physicals tests used to map out and analyze thermal management issues. Not only does this method result in several iterations for each newly proposed design, but thousands of wasted man-hours and dollars in order to analyze, redesign and run each physical model test over and over and over again. The right set of thermal management tools allow manufacturers and designers to “virtually prototype” instead of physically testing, saving time, money and resources. By properly preparing the geometry and meshing, TAITherm will give you a comprehensive understanding of conduction paths, radiation from part to part and how the materials will react to heat. Another topic to consider is the continuous growth in “green engineering.” Topics such as emission standards challenge engineers to create a machine that meets the requirements all while pleasing the customer at the same time. TAITherm can assist in this process to not only meet these requirements but also keep costs contained and designs on track. Why bother modeling with TAITherm? CFD is not enough. Heavy vehicles do more than commute passengers. They are often at work –towing, pushing and hauling. By solely using CFD tools, modelers will only capture one moment in time, not the transient real-life situation. We can’t forget that the real world can be a messy place. Heavy vehicles do not just operate on smooth, clean roads. TAITherm can simulate the real-world conditions that these types of vehicles operate in on a day-to-day basis. CFD is also slow and computationally expensive. By coupling with TAITherm, the simulation process becomes faster, more flexible and more accurate. TAITherm covers heavy vehicle systems in their entirety. From underhood, to exhaust systems, brakes and everything in between, TAITherm is can simulate it all. Steady state analysis typically results in one of two things: either an overestimation or underestimation in engineering. For example, modeling a hill climb scenario in steady state is an over estimation whereas steady-state max speed is an underestimation, since holding the vehicle at a constant high speed for long periods of time is an unrealistic operating condition. Transient simulation early on in the design process can reduce this error in estimation as well as reduce developmental costs and dependency on prototypes. In order to optimize the cost of materials, it is necessary to simulate the real driving conditions of a vehicle. Don’t believe us yet? We don’t expect you to. Let us show you instead. At ThermoAnalytics, we have mastered both the art and science of thermal modeling, specifically, transient methodologies. Using TAITherm you will get accurate, reliable simulation data that will allow you to optimize your heavy vehicle design, manufacturing, and performance early in the design phase. If you have the resources, we can train you to use TAITherm in just two days. If not, let us do the heavy lifting for you by completing your heavy vehicle analysis through a services project. 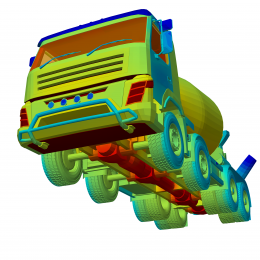 Learn more about the benefits of performing three-dimensional, real-world transient analyses on heavy vehicles.